Working with A/V materials is always an adventure. One of the biggest hazards with A/V materials is they are a preservation risk factor because they deteriorate over time. As well, the equipment needed to play many (maybe a variety or diversity of) formats is increasingly harder to find and maintain in our digital world, which makes transfer to digital files the most practical preservation strategy for most formats. Experts predict that A/V collections have approximately a 15-year window until they deteriorate beyond redemption making the need for digitization even more essential. 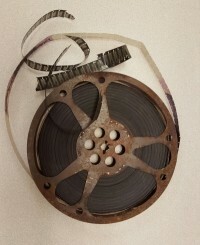 This terrifying timeline coupled with the University Libraries’ strategic goal to “describe and digitize all distinctive and unique collections, with particular emphasis on at-risk formats like audio and video”  has led Special Collections to develop a digitization program for A/V holdings. With so many different formats, this blog post will focus on just one of these, 16 millimeter film. 16 millimeter film is one of the most stable of all A/V formats if properly stored. Special Collections stores our nearly 9,000 films in cool storage. The temperature of our cool storage facility is 55 degrees with a relative humidity of 40%. Vinegar syndrome is one of the largest risk factors for film. This is caused when high heat and humidity break down the cellulose and acetic acid in the base. A vinegar like odor is created from the acetic acid hence the name, vinegar syndrome. Vinegar syndrome makes the film brittle and causes it to shrink. When vinegar syndrome takes hold, the best solution is to create a digital version of the film before it is too late. One of the exciting aspects of being an archivist is uncovering hidden treasures. 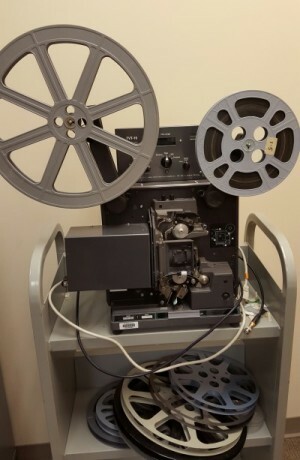 As part of our digitization efforts, Special Collections purchased a 16 millimeter film digital scanner. The scanner takes the 16 millimeter film in its native 4:3 aspect ratio and digitizes it frame by frame. The scanner is coupled with a BlackMagic Design UltraStudio 4K video recorder deck to capture the file. It is the job of the UltraStudio 4K to take the analog file and create a digital version. The day the scanner arrived was one of the most exciting days I have had at Penn State. (My archival nerd level was off the charts.) After setting up our new “toy,” nicknamed Orson Reels, it was time to try it out. My colleague, Tim Babcock, randomly picked a film off of the shelf in cool storage. Our intentions were to make sure we got the scanner settings right and the content of the film was not important at this point. One of the exciting aspects of being an archivist is uncovering hidden treasures. Once we started digitizing the film, we realized we had found one of these treasures. The film was a promotional video that was created in the 1950’s to promote the expanding mission of Penn State as a newly minted university. Not only was the film in great shape, no signs of vinegar syndrome, it’s message of continued growth and focus on pioneering research still resonate today, 60 years later. We shared the film on the only online platform we currently have available to us, YouTube. While YouTube served its purpose in allowing us to share the video to many viewers, it is not the best platform for sharing digitized content with researchers. There are many downfalls to sharing on YouTube, including its captioning process that requires someone to go through line by line to edit the text. The exciting outcome of sharing the film online was that the film was a huge hit and was even shared by Penn State’s Alumni Association. This brought much needed recognition to Special Collections and our daily battle to save the past for future researchers. Not every film that we have digitized since has had such an impact, but that does not diminish their importance to future researchers. However, it remains vitally important to continue to digitize all of the different A/V formats that we possess before they are lost to the ravages of time. “Meeting the Challenge of Media Preservation: Strategies and Solutions,” Indiana University Bloomington, last modified September 2011, accessed September 17, 2014, http://www.indiana.edu/~medpres/documents/iu_mpi_report_public.pdf. “University Libraries Strategic Plan 2014-2019,” Penn State University Libraries, http://www.libraries.psu.edu/psul/admin/stratplan2014.html.